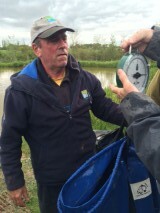 Mickey Meah doubled his weight for the doubles result. Dave Goodhall had two good size carp one just over 10-0-0 and the other was 11-2-0. Kev Lees had a good size carp of 11-6-0. Not the winning net but the best one from an end peg eh Jack. It seems as though everyone wanted an end peg at this match. But it wasn’t an end peg that won it in fact it was the ‘flyer peg’ drawn by Kev Lees that won the match with 40-0. 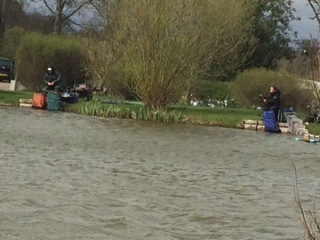 Followed by the two end peg anglers Jack and Trev on each side of the pool. At the end (no pun intended) it was generally agreed that only two fishable pegs were omitted from the match. 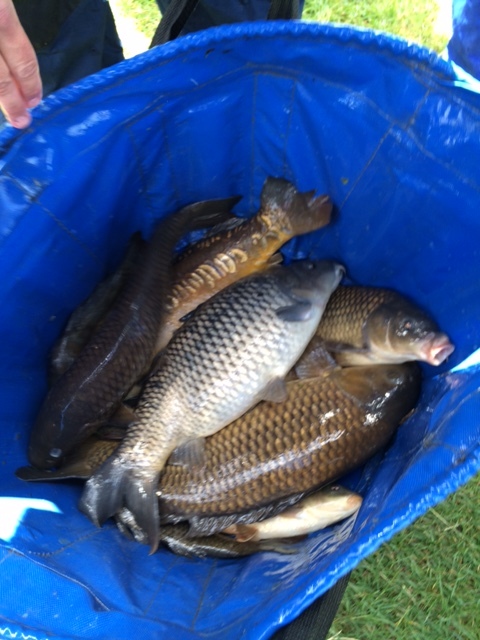 With many struggling on the pole the majority of fish were taken on feeder methods. 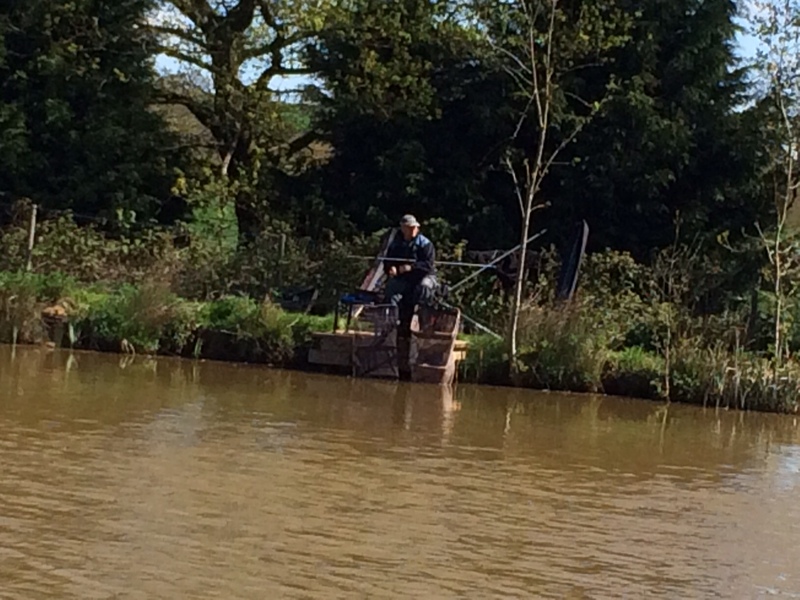 However, Kev continued fishing the pole and won the match with a 6-2-0 margin. There were squeals of delight when Red managed to land a giant crayfish, I didn’t land one but the b*st*rds sat on the bottom knitting with my rig, which was a total write off once I struck, I did see the pincers rise above the water and then it dropped all the stitches and left me with a mono-filament birds nest. Meanwhile Rob on the other bank gave his the size 10 treatment, see you Jimmy, splash! The result means Baz stays top of the leader board but the chasing pack are closing the gap. Don’t forget to give this page a rating by clicking on the title and selecting the 5 star rating and you can leave comments too. Next match Sat 27th Jun, 2015 at Woodlands View draw at 12 p.m. The winning bag – well done Paul. Mr Jinks was top cat at Hampton Springs claiming a win and the golden peg. 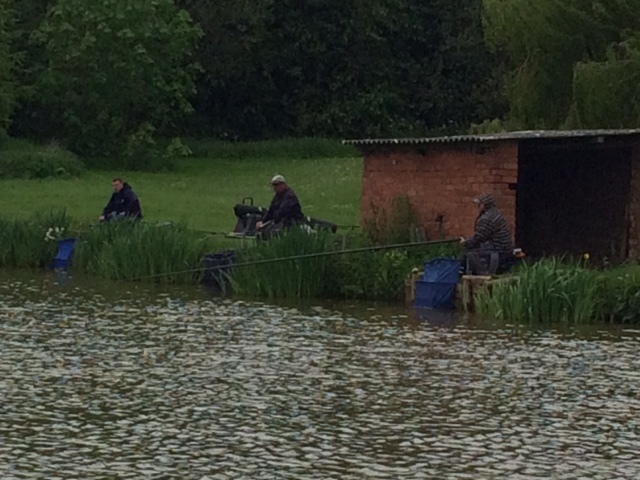 Inclement weather conditions throughout the match meant that most were fishing under brollies. Jinksy weighed in with 35-0-0, to claim 1st place in the frame and win the Golden peg ( 2 matches in a row that the golden peg has been won) including a good 7-0-0 carp. Guy was second with 28-10-0 caught on pole and feeder off the island. Next in the frame was Alan (I’ve got 100lbs) Lees who couldn’t believe how much weight the fish had lost by the time it came for him to weigh in. A special mention for Martin, who threw everything in to try to win before the All-In chasing the golden peg win, hope you didn’t lose to much tackle! The results this week changes the lead on the leaderboard, Baz takes over at the top. Rob McKee continues his winning streak at Cudmore. A bright sunny day with a steady gusting wind, caused Pool 1 to be choppy throughout the match, it couldn’t put a stop to Rob McKee’s winning streak even though the pool seemed devoid of fish (probably gone to the Arena for the Fish o’ mania event). Rob offered 15-0-0 at the scales, and it was a close second for Baz down at the other end of the pool who produced 14-0-0, so Rob also cashed in winning the Golden peg. Bill and Ted’s excellent adventure to Cudmore couldn’t have got off to a worse start by missing the turning to the pools, however it didn’t turn into a bogus journey for Ted as he weighed in with 12-4-0, excellent! Meanwhile, there were 6 ‘dry’ / DNW at this match which fuelled the rumour of netting for the fisho’ finals, Rob, Barry and Ted will tell you they missed a few though. The result catapulted Rob into the lead, closely followed by Baz on the leaderboard. It was like Polling day all over again, a bright day, a very good turnout and a good day for the two Scottish anglers. Rob McKee trounced the rest of the competitors with a brilliant display of casting feeder through the large willow tree to the island to finish the match with 59-12. In second place, Rob Gittins weighed in 25-0 closely followed by Martin on 24-0. One casualty was Rob McKee’s landing net handle, probably from overuse. The result means that Martin is still top of the leader board. Woodside was a mixed bag, both in terms of weather and the fish being caught, it was warm and sunny for the majority, however some pegs were left in the shade out of the sun and fishing for anything that swims. Guy Jones, another one in the net. Guy Jones made his first appearance of the season and took first place in the frame offering 22-0-0 at the scales, fishing pole throughout the match on peg 9. Not even the distraction of Ted’s casting with both pellet waggler and feeder could put him off. Neither could he stop Trev from recording equal third in the frame with Terry with 16-12-0. In second place was Brian who was as surprised as anyone that the ‘fish found him’ on peg one, half way through the match. Brian persevered with method feeder and the carp responded, even though most seemed to prefer cruising past him as the conditions improved. Another notable catch of the day was the 3-0-0 Perch caught by Kev Lees. Woodside is renowned for it’s specimen Perch. Another good attendance for the opening match of our club season at Becketts Pool on Sunday, it was a difficult match mainly due to the wind, which brought temperatures down, and made fishing the pole impossible for some. Many anglers were sitting it out on either 1 or 2 feeder / bomb rods for the 5 hour duration. 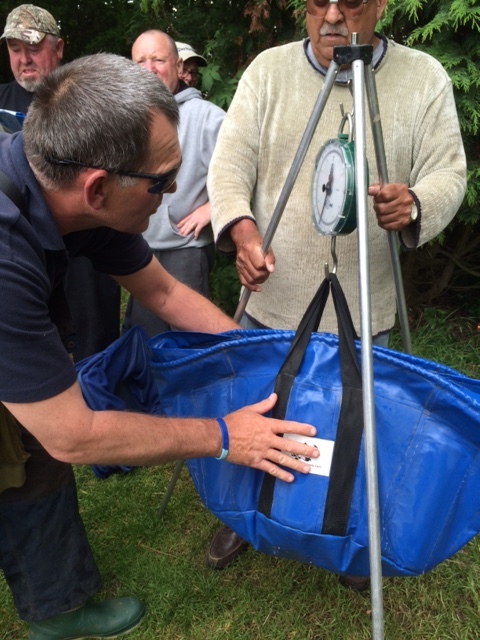 Barry caught the heaviest fish of the season so far which went to 11-8 on the scales. This also helped him to 2nd place on the day. Dan got off to a flying start from peg 22 landing good sized carp within the first hour finishing the match in 3rd place, however at the top end of the pool, Martin was regularly landing enough fish to win the match with 51-0, and start the season top of the leader board.